Patti Abbott challenged everyone to write this week about a “Friday Forgotten” book that we read in college, or between 18 and 23-ish. I reached back into the memory pile and pulled out a peculiar book that has, at least, stayed in my mind since my first encounter with it at university—appropriately enough, since it’s a book about memory and time, if not quite a crime novel per se. The French "nouveau roman" of the 1950s and '60s often used crime fiction as a model, usually with little concern for some of the imperatives of the genre (such as resolving the plot, or even showing whether a crime has actually taken place). But how and why they chose to use the crime genre is interesting in itself. It's a commonplace in crime fiction reviews to say that the setting or the city is one of the main characters--and it's a commonplace in the current crime-fiction reviewing that noir and mystery novels are excellent sources of information and atmosphere about foreign cities. In Michel Butor's 1957 Passing Time, it's literally the case that the city is a character, and the crime novel as a guidebook is a central theme of the story. The novel is the journal of Jacques Revel, a French clerk who has traveled to the industrial city of Bleston (a fictionalized Manchester, where Butor had spent time) in the north of England to translate letters for an English firm. The journal covers his year-long stay, but he arrives in October and doesn't start the journal until May, and he relates his earlier and current experiences in no particular order, causing a jumble of time (reflected in the margins of the book, which give the month of the writing and of the event related). Upon his arrival, in the middle of the night, Revel is thrust into a strange city without any guide or assistance. 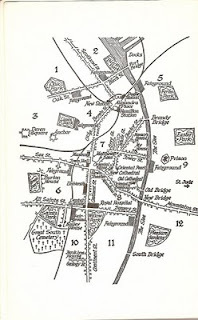 Ultimately he discovers a crime novel, The Bleston Murder, that depicts the city in such detail that he uses it as his map and his guide, more so than even the characters that he becomes involved with. 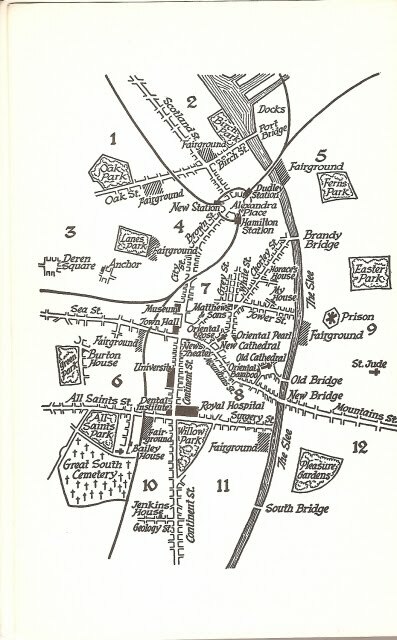 And Revel’s narrative is full of explicit walking and bus directions, explorations of monuments (in particular a cathedral), and other concrete evocations of the city, in the fashion of a very “placed” crime novel—Butor even includes a map, a feature of some recent Scandinavian crime-wave books. He discovers that the murder depicted in The Bleston Murder may be a version of an actual crime, and that the real murderer may not have been identified (and that the writer may have obscured his identity from fear of retribution). So far, it sounds like a conventional mystery novel. And the plot thickens when the real murderer is (maybe) trying to kill the author, plus there is a series of mysterious fires. But Butor is more interested in the splintering of time and perception than in seeking a resolution to the story. But there are interesting meditations on the genre by the pseudonymous author of the novel-within-the-novel, J.C. Hamilton, interspersed here and there in the journal. Hamilton says that there are two murders in a detective story, "of which the first, committed by the criminal, is only the occasion of the second, in which he is the victim of the pure, unpunishable murderer, the detective, who kills him not by using…a silenced shot or the twist of a silk stocking, but by the explosion of truth." He also points out that "in detective fiction the story goes against the stream, beginning with the crime, the climax of all the dramatic events which the detective has to rediscover gradually…in many respets more natural than the narrative proceeding without a backward look, where the first day of the story is followed by the second and then by subsequent days in their calendar order," which is of course the orderliness that Revel and his author, Butor, are explicitly not following in Passing Time (though also not following the reverse orderliness of the detective). The 1960 English translation by Jean Stewart has gone through a number of different editions, though I believe it's now out of print (and the nouveau roman is indeed not in fashion in academia as much as it was when I was in college and first encountered Butor, Alain Robbe-Grillet, et al.). The original French title is L’emploi du temps, both the English and the French inevitably evoking Proust’s “lost time.” But Butor’s book doesn’t set up a hurdle for the reader with sheer length (like Proust) or intellectual pretension. Passing Time takes the crime genre, and its particularly close attention to place and time, very seriously, in the fashion of the nouveau roman’s very literal and “objective” approach to writing; then he splinters time, place, and plot, and serves up a delectable, if frustrating, conundrum of a story that is disorderly, like life while dissecting the orderliness of fiction, the reverse-order of detective fiction, and the artificial order of memory. Fascinating, Glenn and I have never heard about this before. An excellent, many layered novel. What first attracted me to it was the perfectly described ambience of Manchester 1952 plus, unlike most of the other novels that got lumped together in the Nouveau Roman genre, on the surface it is a pleb-friendly novel in that the author doesn't indulge in inscrutable prose, nor jump from one moment in time to another without making it clear he is doing so. But slowly it draws the reader into realising the surface isn't as solid as it first appeared to be; even the banal has a sinister significance; current events throw a different light on past events. The narrator's misinterpretation of words not of his native tongue, his misconceived idea that he has betrayed a friend in an attempt to curry favour with a young woman and his depressed state of mind lead him and the reader on wild goose chases on the trail of a murderer and the dark soul of the city itself. As the narrator leaves the city to return to his native France he leaves behind the biggest mystery of all: what happened on the 29th February?